DTI Secretary Hon. 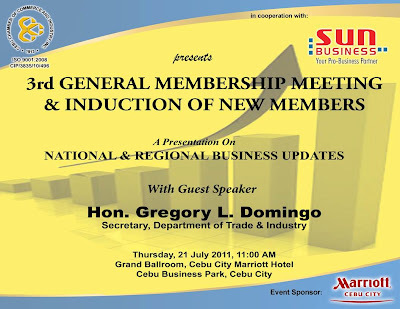 Gregory L. Domingo is guest speaker at Cebu Chamber of Commerce and Industry (CCCI) General Membership Meeting. 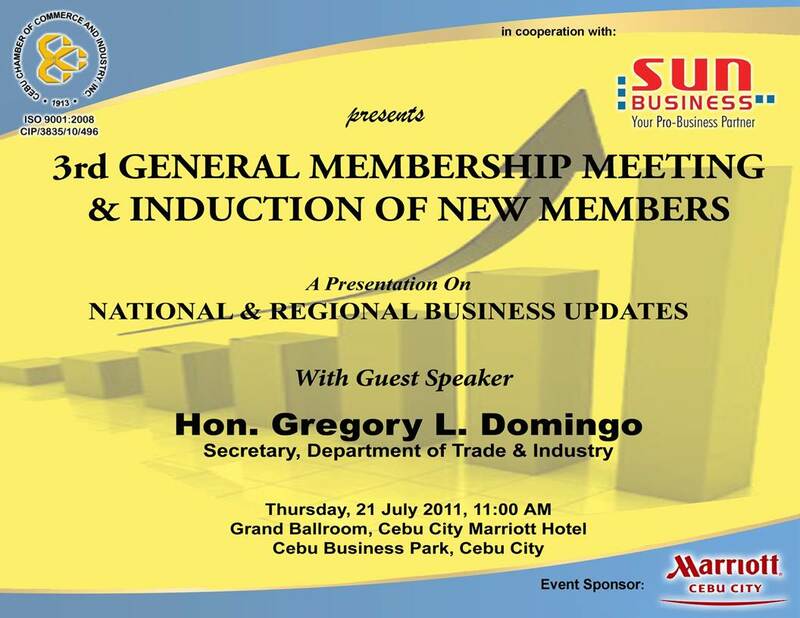 The Cebu Chamber of Commerce and Industry (CCCI) will hold its 3rd General Membership Meeting (GMM) on July 21, 2011 (Thursday),11:00 AM at Ballrooms 1 and 2 of the Marriott Hotel, Cebu Business Park, Cebu City. During this event, Induction of the new members will also take place. Department of Trade and Industry (DTI) Secretary Hon. Domingo will grace the event as Guest Speaker. National and regional business updates are expected to be discussed by the Secretary at his presentation with some insights as to current trends on international trade. Industry players, businessmen, chamber members and the general public will surely gain insights from this occasion. Digitel Mobile, Philippines (SUN Cellular) country’s emerging telecoms provider who will make a luncheon presentation of their consumer promotions as well as corporate & business applications. is CCCI's partner in hosting the event. For participation details and other information, please call the chamber at 232-1421 to 24 local 110 / 111 and look for Joy/Jen/Gretel. 0 comments: on "CCCI 3rd General Meeting & Induction of new Members Marriott Hotel Cebu"